VIRTUAL REALITY JOURNALISM – Digital Artefact. Stories told to us through cinema, the written word and recounted by those around us. From the moment we check our devices – our Instagram, our Twitter and our countless other news feeds, we are inundated with stories of other’s. Throughout centuries of storytelling, one thing has remained consistent – our inability to completely experience what the story-teller is truly describing. Yes, we can imagine and emotionally immerse ourselves, but we are never able to truly grasp, in its entirety, the physical experience of those telling a story. There is an ever-present wall between the story-teller and the listener, constantly dividing you from someone else. Story-tellers who feel the presence of the wall looming over each story they share, are journalists. No matter how wrenching the photo or how precise the writing, journalists are unable to rid the dividing roles of consumer and the other. Consumers of news stories are only afforded abilities to feel for, but never feel with those being represented in a story. That is, however, until the inception of virtual reality journalism. Virtual reality journalism, still in its infancy in terms of form and usage, combines the experiences of VR with journalistic endeavours to produce immersive simulations of the stories being portrayed. Throughout the piece of research being proposed, it is my aim to investigate the practices of VR in mainstream news and the changes in journalism as a result of interactive story-telling. But first, it is important to understand the functions, origins and innovators of VR journalism and how it is being used at present. In order to understand virtual reality journalism, one must first understand the function of virtual reality itself. Virtual reality is understood as being ‘near reality’, or as real as possible. The purpose of VR is to emulate the reality of human experience through technology. Reality of human experience encompasses how each of our functioning senses and perceptions work collectively to decode and encode our environment. VR aims to emulate environments through 3-D computer generation in order to stimulate human sensory perception – thus creating a near real experience. The experiences of VR are immersive, interactive and grounded in achieving realism to the highest degree. Utilising the ability to simulate reality and create near real experiences, the journalism industry has begun using immersive interactive story-telling. Immersive journalism or Virtual Reality Journalism aims to create empathy rather than sympathy for the stories being told. Pioneer in VR journalism, Nonny de la Pena’s mission is to “tell tough, real life stories that create deep empathy for viewers – all through goggles”. VR Journalism has the capability to bridge the gap between consumers of news and the stories being told. Pena is creating interactive and immersive stories so that audiences are able to feel and stand amongst harrowing experiences which we only read about, but not live ourselves. Immersing people within the stories they consume, through VR, has the capability to lessen the construct of ‘us’ and ‘them’ creating less othering and divide. HOW IS IT BEING UTILISED – PROJECT SYRIA. Project Syria, created by Nonny de la Pena, is an interactive experience of the war in Syrian that aims to go beyond reading about the experiences of other’s. This example of VR journalism is important as it highlights how immersive journalism works and why it is impactful. 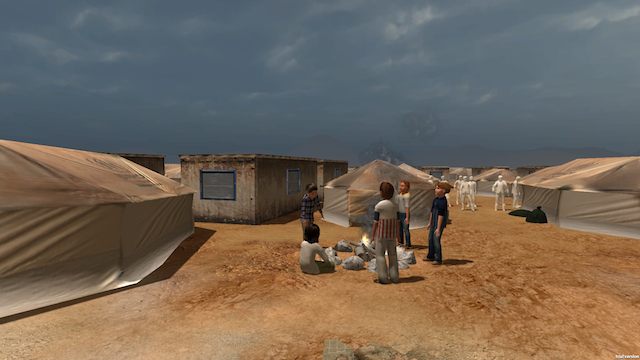 Project Syria, commissioned by the University of Southern California, used VR to implant audiences into the life as a citizen caught amongst the Syrian conflict. As a person reading about the harrowing events, killings and displaced people, your mind can only imagine so far. However, with VR, all our senses are stimulated which gives us an entirely new insight into the lives of people affected by war. DIGITAL ARTEFACT – INTERACTIVE ESSAY. For my Digital Artefact, I am going to choose one news story I wish to report on and create an interactive and visual story using the practices involved in creating VR Journalism. As I am limited in the technology used to create VR, I am unable to make my own VR news story. However, I plan on using the principles of VR to create an immersive news story that utilises multiple senses in order to create an experience whilst consuming the news. Aurasma, an augmented reality application is the program I plan on using to create an interactive news story with the principles of VR journalism. Aurasma uses technology to recognise images and develop them into holographic images. I will use this technology to develop an interactive visual news story for people to use. Over the weeks leading up to the submission of my DA, I will create an online progress journal (blog) detailing the processes involved in making my own piece of interactive journalism.